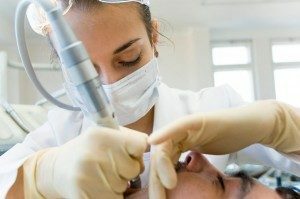 Young man is receiving a white filling. Tooth color fillings “white fillings” are replacing amalgam fillings “silver fillings.” One advantage of the tooth color fillings is a more natural appearance. More importantly, your dentist will not have to remove as much tooth structure. What is Bonding and how is it used? Bonding is also used to repair chips and spaces between the teeth. This procedure can usually be done without being numbed. Over time the bonding can chip or stain and need to be replaced. They will not lighten if you decide to whiten your teeth so whitening is recommended before bonding is done.